This guide provides histories of minority communities in Charlotte, some of which have disappeared or been gentrified, but many are very much alive. In 1983, seven Charlotte churches came together to establish Habitat for Humanity of Charlotte, with the major goal of housing the city’s poor.6 Chairman John Crosland, Jr. contributed to the initial fund of the organization and helped to inspire others in the Charlotte area to help fund the mission to provide housing.7 In 1987, Charlotte was chosen as the fourth site of the week-long Jimmy Carter work project. The Washington Post reported Carter “traveled by chartered Trailways bus to a hot and sticky inner-city slum” to spend “a week as a volunteer carpenter on a housing project for the poor.” That slum was Optimist Park and the project was one of the most ambitious yet, seeking to “build 14 houses, covering an entire city block, in just five days.” By 1987, Optimist Park was considered to be a struggling section of the city. At the beginning of the decade, ninety-seven percent of houses in the neighborhood were considered deteriorated or dilapidated.8 Unlike the limited support Habitat projects had received in Chicago, Charlotteans overwhelmed the Habitat office with offers to help with the project and more than 350 volunteers aided the building of houses in Optimist Park each day for a week. The Habitat program enabled more than a dozen families to own their own homes, paying down a no-interest mortgage in payments of $150 per month.9 The program worked so well, that more homes were built in the years to come, increasing the neighborhood’s home ownership rates. Lawrence Maloney, “Charlotte’s Force of Nature,” Builder, February 5, 2007. Charlotte-Mecklenburg Planning Commission, “Optimist Park Neighborhood Plan,” March, 2002. “Carter Says Helping to Build Houses for the Poor One of ‘Greatest Blessings,’” The Washington Post, August 15, 1987. ​Small but Significant: The Optimist Park Community, UNC Charlotte Honors College and Charlotte Action Research Project interviews on Charlotte neighborhoods, J. Murrey Atkins Library Special Collections, University of North Carolina Charlotte, Charlotte, North Carolina. Charlotte-Mecklenburg Planning Commission, "Optimist Park Neighborhood Plan," March 2002, Charlotte, N.C.: The Commission. Charlotte-Mecklenburg Planning Commission, "Optimist Park Special Project Plan: adopted July 1983.," July 1983, Charlotte-Mecklenburg Planning Commission, N.C.
Thomas Hanchett, "Sorting Out the New South City: Charlotte and its Neighborhoods," PhD diss., University of North Carolina, Chapel Hill, 1993. 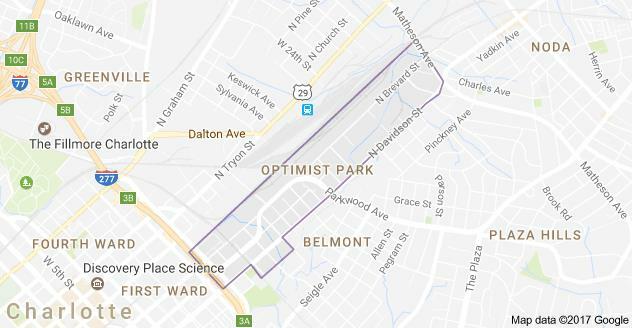 2006 August 25, Mostly speaks of the Belmont neighborhood, but does voice concerns over the impact of Habitat for Humanity in Optimist Park. 2015-2016, uncc Honors College and Charlotte Action Research Project interviews on Charlotte neighborhoods.